Aristotle Circle’s Independent School Entrance Exam® (ISEE®) Lower Level Practice Test prepares your child for the ISEE® through practice and familiarization with the ISEE® sections and question types. Our full-length Practice Test will help maximize your child’s test-taking confidence and scores. You can also assess your child’s performance and see which of the five ISEE® sections need improvement: Verbal Reasoning, Quantitative Reasoning, Reading Comprehension, Mathematics Achievement, and the Essay. Purchase separately or with the ISEE® Preparation Workbook for Lower Level admissions. 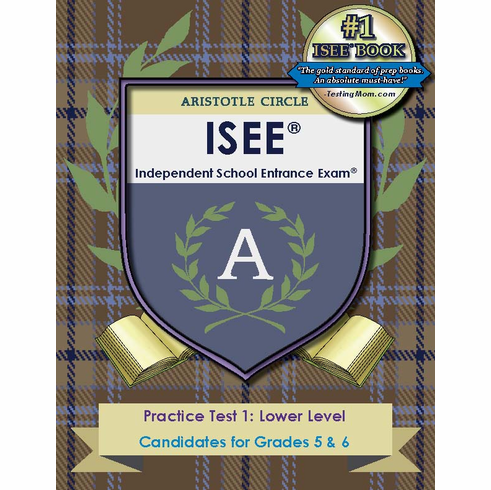 Aristotle Circle’s ISEE® Practice Test is designed to maximize your child’s performance and scores on the actual exam day by helping ensure there are no surprises. Our Practice Test will help your child know what to expect on the exam, and give them the opportunity to reinforce strengths and improve weaknesses before taking the ISEE®. Aristotle Circle offers a full-range of ISEE® services, including a supplementary ISEE® Lower Level Workbook, tutoring services, interview preparation, and admissions consulting. Aristotle Circle's ISEE® Lower Level Practice Test and ISEE® Lower Level Workbook questions align with the national standards in English and Mathematics as adopted by the National Council of Teachers of English (NCTE), the International Reading Association (IRA), and the National Council of Teachers of Mathematics (NCTM). Want to go beyond our books? We also offer tutoring and test prep services . Contact us to find out more today!